From progressive education policies in the late 1600s, to the arrival of immigrants and industry in the 1800s, to the establishment of diverse housing projects and churches up to the present day, Jamaica Plain's colorful and action-filled past is worth exploring as part of Boston's unique history. THEATER The Footlight Club of Jamaica Plain is the oldest community theater in the country. ANIMAL WELFARE In 1868 George Angell published the first magazine on the humane care and welfare of animals, “Our Dumb Animal Friends: We Speak for Those Who Cannot Speak for Themselves.” He was also the founder of the M.S.P.C.A. whose animal hospital is on South Huntington Avenue. MEDICAL On Oct. 16, 1846, Dr. John C. Warren, a Jamaica Plain resident, performed the first surgery publicly demonstrating the use of ether on a patient. Boston’s Jamaica Plain neighborhood was a part of the separate town of Roxbury from 1630 until 1851. An influential center of West Roxbury, the town was annexed in 1874 to the city of Boston. Early settlers, like William Curtis who built his house in 1639, were mostly farmers and fruit growers. The Eliot School was established in 1676 with a grant of land from the Thomas and Ruggles families and later an endowment from Rev. John Eliot, Apostle to the Indians. The donors “stipulated that the school be open to all children, white, black, and Indian.”  The current Eliot School building dates to 1832. The first church in Jamaica Plain, the Third Parish in Roxbury, was established in 1769. Rev. William Gordon, its first pastor, served as chaplain in the Provincial Congress in 1775. The Loring-Greenough House was built in 1760 for Joshua Loring, a British Naval Commodore and loyalist appointed to the governor’s council. In 1774 after opposition from his neighbors, Loring fled from his house to join with the British in Boston. The home was later used by Washington's troops as a hospital during the Revolutionary War. Eugene Green, Jamaica Plain. Boston 200 Neighborhood Series (Boston: Boston 200 Corp., 1976), 7. In 1796 after the Revolutionary War, the Jamaica Plain Aqueduct Company developed an important water supply system from Jamaica Pond to Fort Hill serving Boston’s water needs. The system used gravity flow from the pond through miles of wooden pipes. Transportation developments in the 19th century influenced the growth of Jamaica Plain. The Boston and Providence Railroad was constructed through Jamaica Plain in 1834 with a station at Green Street opening in 1841. By the 1870s horse drawn street cars were serving the growing community, and later electric streetcars took their place. For more insights on the impact of these on neighborhood development see Sam Bass Warner’s book, Streetcar Suburbs. Also during the late 19th century and early 20th century various factories and 24 breweries were built in Jamaica Plain, mostly in the Heath Street and Stoney Brook areas. In 1876 the B. F. Sturtevant fan company expanded and moved to Jamaica Plain, and by 1901 it was employing 650 men and manufacturing many products. The Thomas G. Plant Shoe Company had one of the world’s largest shoe factories on the site of the current Stop and Shop plaza from 1896 to 1976. In the 1920s the Moxie soft drink company developed a factory complex called Moxieland nearby at the site of today’s Bromley Heath Housing Project. In those days Moxie outsold CocaCola. Immigrant groups from Ireland, Germany, Latvia, and other countries contributed to neighborhood growth and provided workers for these industries. Several large churches and many smaller ones started up to serve the spiritual needs of the growing population. The German churches included the First German Baptist Church (now River of Life Church), the German Methodist Episcopal Church (now St. Andrew's Methodist), and the German Reformed Christ Church. 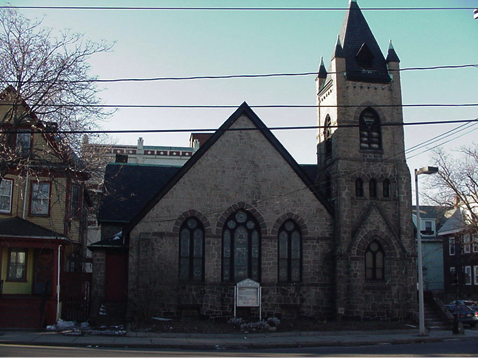 Other churches started during the 1800s including St. John’s Episcopal (1841), Central Congregational (1853), Boylston Congregational Church (1879), First Baptist (1842), Blessed Sacrament Church (1891), and St. Thomas Aquinas Church (1869). Boston Redevelopment Authority Research Division, Historical Boston in Context: 1970-2000 Decennial Census, Boston: B.R.A., 2015. 2010 information from 2010 U.S. Census, STF 1, B.R.A. Research Division analysis. 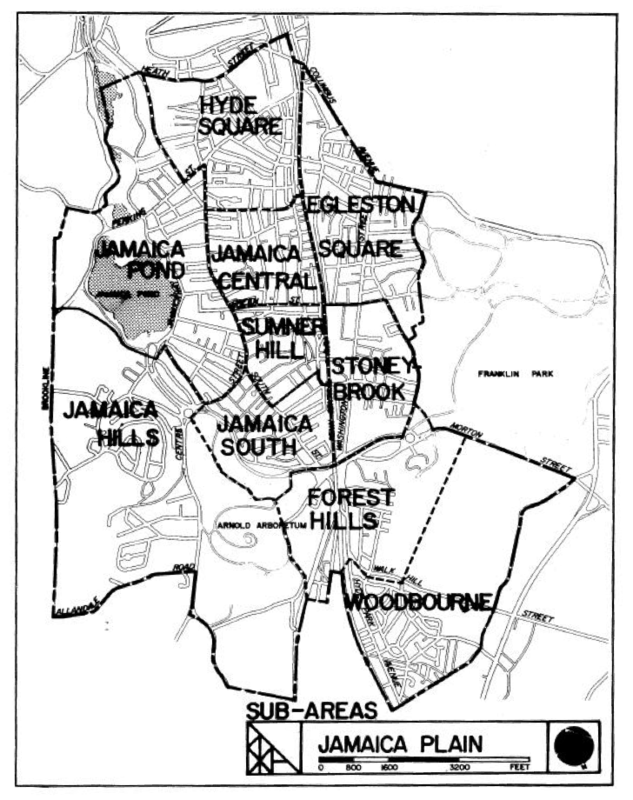 1950 and 1960 data from B.R.A., Jamaica Plain Profile, 1988 (boundaries may vary from later boundaries). 2015 data from “Neighborhood Profiles,” August 2017. Although the population of Jamaica Plain continued to grow during the first half of the 20th century, many of the factories and breweries experienced declines, fires, closures, or relocation. The elevated Orange Line tracks along Washington Street had a negative impact on nearby businesses and residences. The 1930s Depression and later redlining also had negative impacts on housing and housing construction in the community. An important new development in housing took place with the opening of the Heath Street public housing in 1942 and the Bromley Park housing project in 1954. Although Bromley was opened with some fanfare and tours in 1954, it later developed a variety of problems. Primera Iglesia Bautista Hispana was started in 1975. By the 1960s and 1970s many Spanish speaking immigrants from Cuba, Puerto Rico, and other places were moving into Jamaica Plain. These new residents started many small businesses along Centre Street and Washington Street. Spanish speakers also added vitality to the spiritual life of the neighborhood by starting many new churches, including Primera Iglesia de Dios Pentecostal (1969), Iglesia de Dios Pentecostal “Roca de Consolacion” (1969), Iglesia Metodista “San Andres” (1971), Primera Iglesia Bautista Hispana (1975), and Iglesia Comunitaria de Boston (1988). While Jamaica Plain’s population was becoming more diverse during the 1960s and 1970s, it was also declining during that period. In recent decades the elevated Orange Line was taken down. The scars left from demolition for the never-built Southwest Expressway were healed with the Southwest Corridor Park and new building development. These physical changes along with other improvements have brought renewal in Jamaica Plain. Some older industrial buildings have been renovated, and newer businesses like J.P. Licks (ice cream shop and café) have made Centre Street an attractive and lively neighborhood center. The future Jackson Square Recreation Center. Recently, transit-oriented housing developments have sprung up around the Forest Hills MBTA train station. Hundreds of new residential units have been completed or are under way. Green, Eugene. Jamaica Plain. Boston 200 Neighborhood Series. Boston: Boston 200 Corporation, 1976. This 24 page booklet weaves oral histories together along thematic lines and adds some early history of Jamaica Plain. Pictures and illustrations from many eras enhance the text. When the interviews were made over 40 years ago, the protests to stop the Southwest Expressway were fresh in people’s minds. This and other issues of those days are brought to life in the oral histories recorded here. Hirsch, Kathleen. A Home in the Heart of the City: A Woman’s Search for Community. New York: North Point Press, 1998. Kathleen Hirsch's first-hand account of Jamaica Plain in the 1990s is well-written. The author writes about finding and building community in an urban neighborhood, as well as many perennial concerns like balancing career and parenting. Although Hirsch encounters and writes about the diverse aspects of Jamaica Plain, her perspective is basically that of a professional from the Back Bay who is trying to connect with the everyday life of a gentrifying neighborhood. Some of her writing explores the spiritual dimension of community, at least in a general way. She writes, “When I moved here, I didn’t expect that my quest for community would lead me to craftsmen, much less drug dealers or humble Xerox-shop managers, or that a world of Mondays would come to echo the wisdom of the Psalms” (86). After getting a coffee on Sunday morning at Sorella’s café, she reflects on the meaning of Sabbath rest, “To be at rest is to observe the bones of God’s work through man in the world laid bare. To be at rest is to see with clarified vision. And this vision forces me to contemplate not what I am meant to do with my days in this place on earth, but what I am meant to be. To what, here and now, am I to be faithful” (79)? Hoffman, Alexander von. 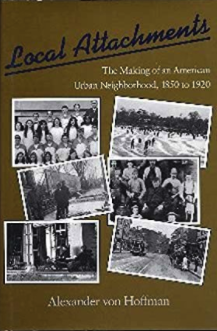 Local Attachments: The Making of an Urban American Neighborhood, 1850-1920. Baltimore: The John Hopkins University Press, 1994. No other book presents such a detailed historical and social analysis of any Boston neighborhood as Hoffman’s Local Attachments does for Jamaica Plain. The author concludes, “if ever we are going to cope with the problems of our cities, we need to understand better the historic neighborhood and how it functioned within the urban system of late nineteenth and early twentieth centuries” (248). The book mines many primary sources including church records to develop a full picture of the social networks and civic spirit that composed a strong sense of local community and public culture in this neighborhood. Its historical perspective “traces the dramatic transformation of Jamaica Plain into a modern urban neighborhood” (xxii). Hoffman explains and documents how “the most important voluntary institutions in any late nineteenth-century American community, and especially in the historic land of the Puritan, were those connected with religion” (122). While Jamaica Plain has continued to change significantly in the last twenty years, this book is still essential reading for anyone seeking to understand the neighborhood. Von Hoffman, Alexander Carl. The Making of the Modern City: The Development of Jamaica Plain, Massachusetts, 1632-1920. Ph. D. dissertation, Harvard University, 1986. Rogovin, Janice. 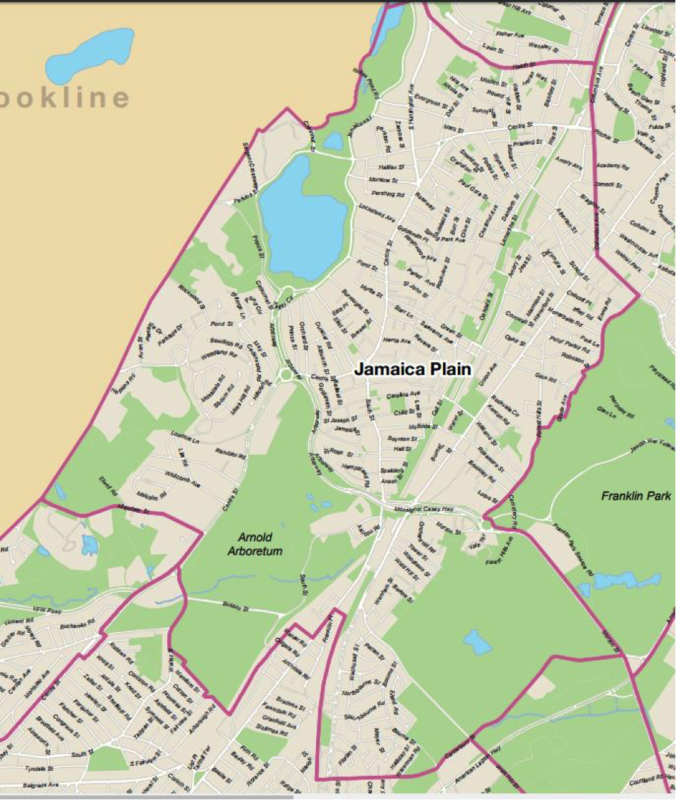 A Sense of Place/ Tu Barrio: Jamaica Plain People and Where They Live. Translated by Yolanda Rivas. Boston: Mercantile Press, 1981. The text (in English and Spanish) is by various JP residents, with editing and photos by Janice Rogovin. Many of the stories bring to life the experiences of residents in the late 1970s up to 1981 as they reflected on community life, their homes, and being forced to move when new people bought the buildings they were living in. The book includes many photos and glimpses into the lives of families who were facing difficult times. Sammarco, Anthony Mitchell. Jamaica Plain. Images of America Series. Charleston, SC: Arcadia Publishing, 1997. Reissued in 2004. Topics covered in the chapters of these books include churches, schools, natural features, community service organizations, transportation, early settlers and their estates and houses. Pictures of the early years of the Boston Children’s Museum illustrate the valuable educational role it played in the community. At one time German groups, clubs, and churches served immigrants working in the neighborhood. Clubs such as the Jamaica Club and the Tuesday Club were once more prominent than today. Churches also sprouted up all over the neighborhood as the population grew. Other important institutions documented with pictures include hospitals such as the Faulkner Hospital and the Veteran’s Administration (VA) Hospital. If you are curious about the history of the Loring-Greenough House or Curtis Hall or you wonder about the origins of Jamaica Plain names like Spring House and Peter Parley Road, these books will give you brief answers. Sammarco, Anthony Mitchell. Jamaica Plain: Then & Now. Charleston, SC: Arcadia Publishing, 2003. The pictures in this volume often repeat the ones in Sammarco’s Images of America book on Jamaica Plain. However, as the title suggests, this work also pairs up old photos with modern photos of more or less the same view. Whitcomb, Harriet Manning. Annals and Reminiscences of Jamaica Plain. Cambridge, Mass. : The Riverside Press, 1897. 64 pages. Whitcomb shares many details of pioneering families and their homes in Jamaica Plain. In the process she connects the community to many historical events in Boston and America. Hay, Ida. Science in the Pleasure Garden: A History of the Arnold Arboretum. Boston: Northeastern University Press, 1995. This well illustrated and comprehensive work details every aspect of the arboretum and its history. The book touches on both science and history in tracing the development of one of North America’s most important arboretums.